Every atom of our bodies has been part of a star. Our very own star, the Sun, is crucial to the development and sustainability of life on Earth. 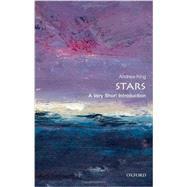 ThisVery Short Introductionpresents a modern, authoritative examination of how stars live, producing all the chemical elements beyond helium, and how they die, sometimes spectacularly, to end as remnants such as black holes. Andrew King shows how understanding the stars is key to understanding the galaxies they inhabit, and thus the history of our entire Universe, as well as the existence of planets like our own. King presents a fascinating exploration of the science of stars, from the mechanisms that allow stars to form and the processes that allow them to shine, as well as the results of their inevitable death. Andrew King is Professor of Astrophysics at the University of Leicester.